Happy Hours. Team Builders. Birthdays. Tourneys. Apartments. Special Events. Reunions. Just 'Cause. Other Happy Customers Include GitHub, Square, McKinsey, Yahoo, Bloomberg, URS Corp, Deloitte, Yammer, Rackspace, Box, Kiva, @WalmartLabs, Kontagent, Vertical Brands, and The California Academy of Sciences. See Customer Testimonials. But you don't have to be a world class company to Make it a Game Night. We have something for everyone! Giant Versions of Board Games. 6 Game Package for $550. Pricing. 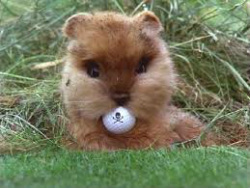 Indoor Safe Golf Balls. More. From $1,250 - $1,750. Pricing. 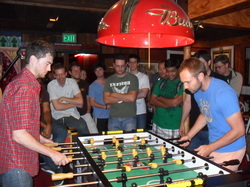 Foosball. Ping Pong. Pool. etc. 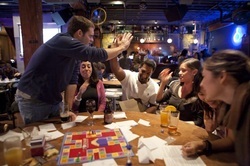 Call or email homefrys to schedule a game night, invite participants to vote for their favorite games... and just show up! 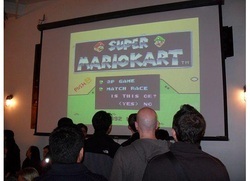 Super NES. O.G. Nintendo. Atari. Football through Tire. Mini Bball. 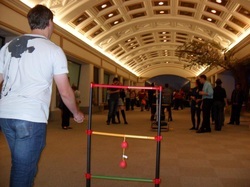 Interactive - great for team building and bonding! Easy - just show up, homefrys does the rest! 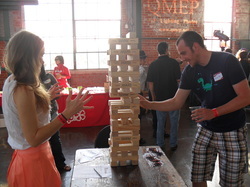 homefrys organized a nifty little game night for over 150 yelpers during one of our recent Yelp Elite Events. They were professional, organized, and friendly... not to mention, totally fun! I can't wait to work with them again and I would recommend homefrys to any and all corporate event planners and attendees alike. Run and tell that, homeboy. – Ruggy Joesten, Community Director, NYC (formerly San Francisco) at Yelp!